Goods take up space. It’s an unavoidable reality. Obviously, it can be prohibitively costly and logistically nightmarish to try and manage all your merchandise on site, which makes warehousing a necessity. While some people might see inventory warehousing as a burden, it can be a huge benefit if handled and coordinated well. With effective and reliable warehouse management services, you can keep your deadlines, assess your goods, plan for seasonal or quarterly changes, and even identify developing trends as they’re happening. If you want to get ahead of your competition and establish yourself in the marketplace, your warehouse can make a big difference in helping you to advance. The layman might envision warehousing storage services as simply a very large storage unit where pallets of bulk shipments simply sit and wait. Peosta Warehousing professionals recognize that there’s much more to safe and efficient warehousing than a lot of building space. 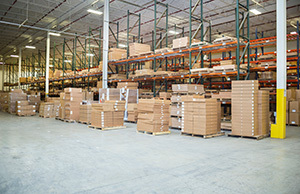 Savvy businesses find warehousing in highly accessibly areas, like Chicago, Kansas City, Minneapolis, and Milwaukee so that goods are within quick reach of end users. But location access isn’t the only critical component of smart warehousing. Technology is key. 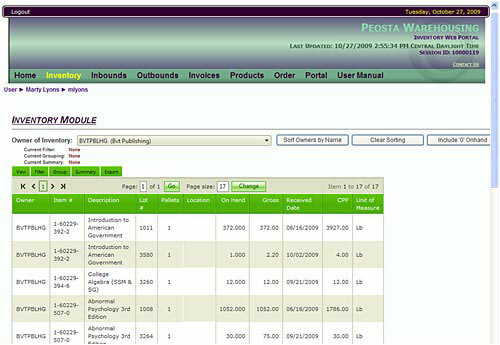 Peosta Warehousing has implemented a secure, state-of-the-art, web-based Inventory Management System, allowing you to view your inventories anytime and from anywhere. EDI and barcoding capabilities are included, which enables you to organize your resources and optimize your fulfillment and distribution processes. Keep track of everything from start to finish with this exceptional system. Click the titles below to learn more about our warehousing services. Our warehousing and distribution services can help you through every step of your supply chain through our Consumer Packaged Goods solutions. We offer flexible, consumer packaged goods mixing centers and transportation options to meet the needs of your business. Our CPG mixing services are designed to improve your product speed to the market. With temperature controlled storage from 48 degrees Fahrenheit to 70 degrees Fahrenheit, your products will stay fresh and secure with Peosta Warehousing. We offer numerous temperature-controlled, rack and floor storage spaces offering protection for your products. We consistently monitor our system with scheduled humidity and temperature checks to ensure the safety and quality of your goods. We also offer product sampling to further ensure quality control as well as flow through racking. We are Organic Certified. To keep your files in order and easy to access, we use software and bar code technology to organize and manage your documents. Our controlled facilities and security systems will keep your paper documents undamaged and protected, and our digital imaging equipment can convert your files quickly and securely. Spread over more than 1,600,000 square feet area, Peosta Warehousing Logistics in Peosta, IA offers huge capacity for warehouse storage solutions. We offer climate controlled, food grade warehouse space allowing businesses to shelf their products before distribution. Our professionals are experts in CPG mixing service, supporting your business operations. We also have experience in document storage. Our warehouses come with state-of-the art security system, featuring dock doors with levers and restraints. Large staging areas, dock shelters, drive-in doors and ESFR sprinkler system are some other features of our facility. Our logistics solutions include public warehousing and contract warehousing. Our services includes cross docking, pick and packaging, quality assurance inspections and more. Reach us now!